Fuorisalone, held in connection with the Milan Furniture Fair, is one of the most important moment of the year in terms of design and interior architecture. The Palazzo Litta hosts every year during Fuorisalone a selection of high-quality exhibitions and attracts an important audience at the very heart of the 5-Vie art & design district. 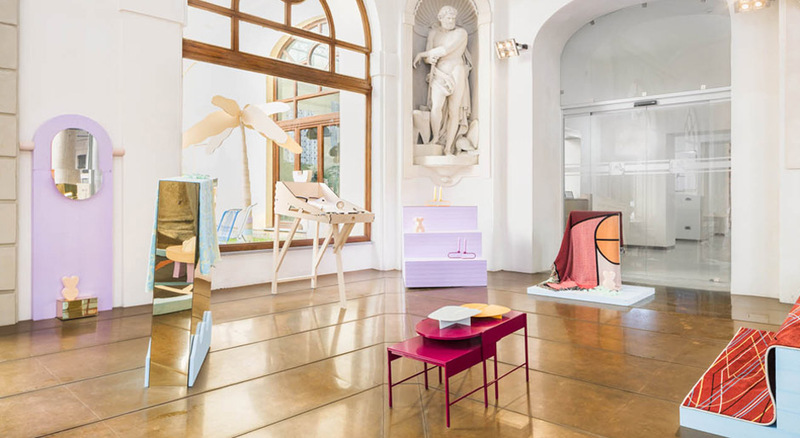 Under the heading SWISS ❤ DESIGN, six aspiring Swiss design studios have been invited by Pro Helvetia to display their products at a large-scale exhibition in Palazzo Litta, within the frame of Milano Salone del Mobile 2018. The exhibition has been selected by designer Matteo Cibic as «one of the best things to see at Salone Del Mobile 2018» in a review for the Evening Standard. The exhibition SWISS ❤ DESIGN was also integrated in the Swiss Design Map Milano – a city map with which the Swiss Consulate General in Milan provides details on Swiss universities, companies and design studios that are represented at the trade fair. diiis design studio was founded in 2015 by Susanne Roser and Martina Staub. During the design process the designer duo particularly targets the balance between functionality, simplicity and aesthetics. Thereby the objects have a clear design vocabulary and display a passion for details. Egli Studio is a Swiss based industrial design studio composed of Thibault Dussex and Yann Mathys. Their interest for materials and processing technologies is translated in their simple and rational design. Their range of work goes from furniture to product design as well as exhibit and space design. Florian Hauswirth works as an independent designer and teaches at the HSLU design university in Lucerne. His work has been shown internationally and has received several awards including the Wallpaper Design Award. His industrial production is a combination of hand made and machine production and rises people’s awareness about materials and development process, displaying craft as a cultural knowledge. Kollektiv vier is a design company which develops interior products and concepts. They successfully launched their first shower curtain collection in November 2016. Since then they extended their product line, which has already been presented in various fairs and design magazines. Schoenstaub offers a collection of woven carpets, printed beach towels and various home objects. Collaborating closely with leading manufacturing enterprises, schoenstaub creates products that incorporate photorealistic motives, graphic elements and fine drawings. Alain Schibli is a Swiss graphic and product designer. His latest creation «Makerball» is a DIY pinball machine kit for adults. Its simple mechanical base can be upgraded digitally and expanded individually. Makerball is a digital yet emotional toytool that matches the Zeitgeist.